A new book edited by City researcher and composer Dr Miguel Mera explores the ways in which music and sound interact with forms of narrative media such as television, video games and film. 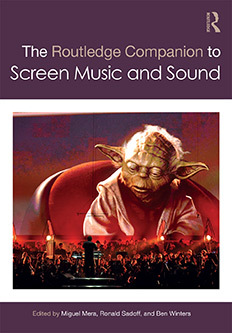 The publication, The Routledge Companion to Screen Music and Sound, includes chapters written by Dr Mera and his co-editors Ronald Sadoff and Ben Winters. Among them is the City academic's chapter Screen Music and the Question of Originality, which discusses the complex territories in which screen music’s disputed notions of originality operate, with a particular focus on the Academy Awards Original Score category and the ways that notions of originality have changed over time. The book includes five areas of study, covering topics such as the history of the discipline, the impact of technology and methodologies for analysing screen music. A diverse range of international scholars have contributed a set of 46 chapters, which move from foundational knowledge to cutting-edge topics that highlight new key areas. Dr Mera is a composer of music for the moving image and a musicologist. He is interested in the combination of practice and theory within the context of contemporary culture and the creative industries. His recent research includes a study that used eye-tracking technology to show how music can direct audiences' attention on screen. The study showed that different types of music can affect where people focus, how quickly their attention is drawn to different areas of the screen and the length of time they spend looking at those areas.